Welcome to the start of the Twofer Challenge. The goal is to make two different cards with two different designs for two different occasions with the same stamps and/or dies. This fun challenge is aimed at stretching our stamps and dies by using them in different ways, and at the same time building our stash of cards. Come join us!! As you can see by the badge above, the challenge is open for two weeks. This gives you lots of time to come up with your designs, make your cards and then photograph (one photo showing both cards) and enter the challenge via the linky provided on the challenge blog. There's lots of samples by the Design Team to show you what the challenge is all about. 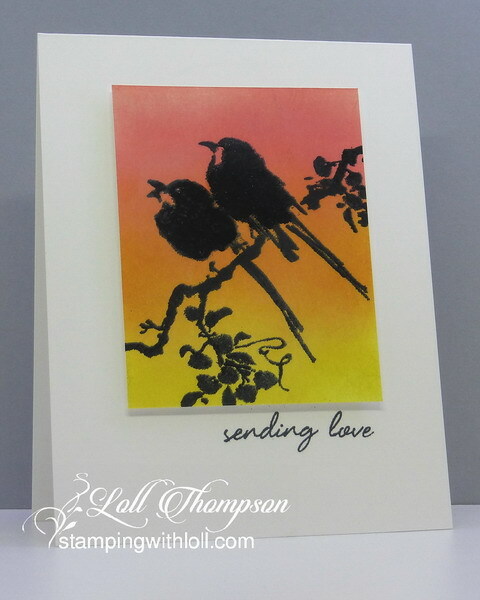 Here's my cards using the Feather prompt with Penny Black stamp "the sweetest song". I had a lot of fun designing these two cards using the bird (feathers) image. For my first card, I masked a second Penny Black stamp (bells & berries), leaving just the one branch of leaves and berries (no bell). I stamped in Sahara Sand ink (very light) and then watercoloured over top of the image with distress inks and a water brush (no line watercolouring). I used distress markers to add some finishing details to the leaves and berries. I then masked "the sweetest sound" stamp, leaving just one bird, inked with Pumice stone distress ink, and stamped the bird over top of the branch, in the middle. I used more pumice stone ink to add a darker head and wing (very subtle). I used more of the same ink to watercolour around my finished image. I then splattered with diluted white ink. The image was framed and a sentiment was stamped in the corner. For the second card, I sponged distress oxide inks (fossilzed amber, spiced marmalade, abandoned coral) to create a sunset background. I stamped "the sweetest sound" image over top with versamark and heat embossed in black. I cut the panel down and added the "sending love" sentiment in black. As I mentioned above, the challenge runs for two weeks. Come check out the amazing cards by the Design Team and then join us! I am at awe with your watercoloring skills, Loll! Your Christmas card is so gorgeous! Your amazing sunset is magical and those birds have the look of spring! It's so clever of you to use birds for the feathers theme. I love the backgrounds - they are gorgeous. And I love the frame around the fbirds on your Christmas card. 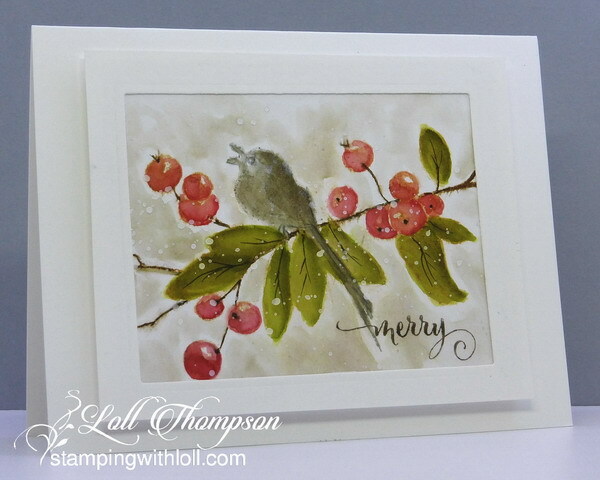 I love how you've combined this stamp with the bells & berries and used just one of the birds! The sunset colors with the black silhouette birds is just as lovely but completely different! An exciting new challenge! Two beautiful cards, Loll. Congrats on being a DT on Darnell's new challenge. Can't wait to participate. Such beautiful birds of a feather flocking here, Loll! I adore that Penny Black stamp ... hope to have one of my own one day ... until that day comes, I'm just as happy to see your gorgeous creations! It's hard to believe you used the same stamp on both cards as they look so different thanks to your clever masking! The watercoloring on the Christmas card is phenomenal - it looks like a painting and the background on the second card paired with the silhouetted birds is spectacular! I am very honored and excited to be on this team with you, Loll! Two equally beautiful cards in very different ways! Love that stamp used as a Valentine! And great masking to use it and the bell stamp together for that lovely muted Christmas card - like a misty Vancouver Christmas! Wow! You took creativity to a whole new level combining two stamps with all that masking! I can't imagine positioning that bird so perfectly, the the impeccable watercoloring of the image. Love the gradient on the silhouetted one too. Fabulous Twofer cards Loll. Love how you have gone 'bird feathers' and your cards are so very different. Love the water colouring and blending. Beautiful! Wow Loll~ These are both stunning little works of art deserving to be framed! Your water coloring on the first one is beyond amazing. I want to order that stamp just so I can CASE your card but I know mine wouldn't come out even a smidgeon as beautiful as yours. These are totally gorgeous! Your cards are fantastic, Loll. Gosh what a wonderful example of the challenge. The silhouette card is so striking. Love those colors. And the other card, with the detail in the bird and leaves is fabulous. Golly! Just wonderful work! Thanks so much for sharing. Hugs! Hi Loll, I found you on Splitcoast a couple of weeks ago and now I'm an ardent fan. Your work is beautiful. I especially love the texture and cleanness of your pieces. Thank you for sharing this creative "twofer" with all of us. Beautiful and clever and each so different! I love the whole concept of this challenge and will look forward to participating. In fact, I made two cards yesterday but have yet to photograph them. Viewing your cards is a real treat! Devine artistry in these two beautiful but different versions of the Penny Black stamp set, leave one so inspired. I loved the no-line watercolouring in your first image, but equally enjoyed the silhouette and vivid sunset in the second. I'm totally inspired by you and the rest of the DT at Twofer, so much so I just might play along. Thanks. I had to check out the original stamp to see how you masked it, Loll. It is amazing what you did, not only the masking but the no-line coloring. The silhouetted birds in the sunset is gorgeous too. Would never know its the same stamp - amazing!!! So wonderful are both versions using that image. I just love the fantastic colors on them too! Loll, well I could just repeat everything that was said above. Amazing and beautiful and so awesome! You are incredible and I am always so inspired by your work! What a fun challenge and I have my two cards ready! This is the best challenge to really get us to use our stamps in creative ways! Thank you Loll for the inspiration! Heart Hugs! You can not go easy Loll :-) It's a real artistry, how you used both stamps to create these two amazing cards. Your masking is great, and your imagination is limitless. Thank you for such a great inspiration! I have to sit at my desk and create something too, because I want to join this beautiful game. The first is very sweet and beautiful and I love the rich colours of the second. 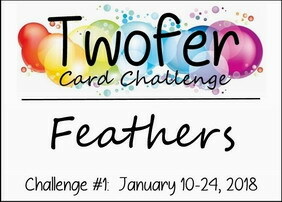 Your cards are both amazing and really help me to understand the Two-Fer Challenge. I love the how you used the stamp to create such very different cards and the creativity that will be stirred as we strive to use our own stamps this way. Your cards are spectacular and I love how one depicts winter, while the other represents summer! 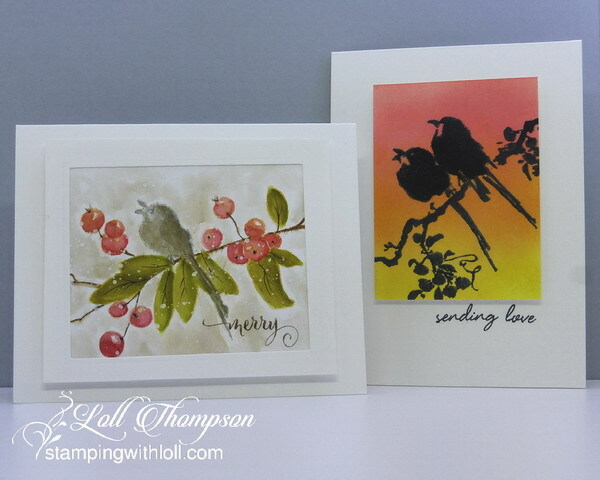 Gorgeous stamping, shading and watercoloring for 2 beautiful creations! Congrats too for being on Darnell's DT! Woot! Gorgeous twofers. Love your watercolouring and then doing a silhouette for your second one is a great idea. So inspiring. Loll, your work is just amazing. I love your explanations and you are such a master with distress inks and fussy cutting. Beautiful cards in every way. What a delight for me to be hanging out in your blog this evening! Beautiful cards - I especially love the watercolor feel of the first one! Beautiful pair of birdie cards, Loll! I love the first, soft, impressionistic one and the second bold, vibrant one. Great job getting 2 completely different looks!